The root of Aristolochia debilis Sieb. et Zucc. Jiangsu, Zhejiang and Anhui provinces in China. Fragrant, spicy after bitter when taste. Chunky, much powder and fragrant. Pungent, bitter, cold, mildly toxic; liver and stomach meridians entered. Promote the flow of qi and alleviate pain, clear heat and remove toxicity. For it has the actions of moving qi and alleviating pain, clearing heat with bitter-cold, it is suitable for syndrome of qi stagnation in liver and stomach complicated with heat. 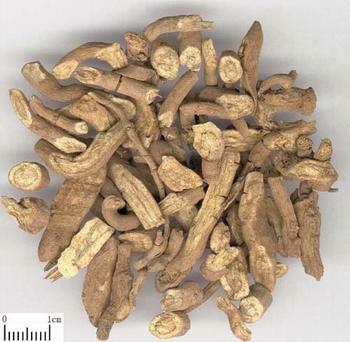 For the syndrome of qi stagnation in liver and stomach manifested as distending pain in chest, hypochondrium and abdomen, it can be ground into powder for oral use alone or combined with the liver-soothing and stomach-harmonizing herbs such as Chuan Lian Zi, Xiang Fu and Mu Xiang. For gastric and abdominal distention due to stomach cold and qi stagnation, it should be combined with the middle-energizer-warming, qi-moving and pain-alleviating herbs such as Gao Liang Jiang, Xiang Fu and Sha Ren. It can not only move qi and alleviate pain but also clear heat and relieve toxicity, and is indicated for diarrhea and dysentery with abdominal pain due to improper diet and summer-damp retention. It can be ground into powder or smashed out the juice alone for oral use, or combined with the heat-clearing, damp-drying and toxicity-relieving herbs such as Huang Lian and Huang Bai. It has the actions of clearing heat, relieving toxicity and detumescence for external use. For abscess, sore and deep-rooted boil, it can be used by ground into powder alone and mixed with water and honeydew, or smashed for local application. For eczema, it can be decocted alone for wash or ground into powder for local application. For bitten by viper, it is usually combined with Bai Zhi for oral and external use. Decoct 3~10 g, l.5～2 g of powder for oral use, proper dosage for external application. Overtaking should be avoided for the side effect of nausea and vomiting, etc.